I’m in my studio, no music on, sitting in my comfy rolling chair thinking about my Bits and Pieces. I’ve been working on this thing for days now and yet there is something about it that doesn’t sit right. Just when I think things are going great and I see the finish line ahead, the train goes off the track. This train hasn’t just gone off the track, no this train has returned to the station. sigh Yup, that’s right! I’m back at the drawing board. This is how my quilt looked the last time we were together. I really thought I had something going here. I had already sewn many of the blocks together into sections but there was something about it that didn’t feel right. Most of the fabrics I used came from the same company, Handloom Batiks, while the others were retrieved from my fabric stash. The solids were obviously from my stash as well as the red fabric in the bottom right corner, the orange woven fabric with the red floral pattern and the golden fabric with the red scribbles. I was pretty much resigned to leave the solid colors in place. Removing them from the mix would be a huge undertaking and I definitely was not up to that challenge. The print fabrics, though, were definitely doable. So, believe it or not my mission today was to eradicate those from my quilt. One by one I took the sections down from my design wall and began disassembling it. I removed all of the stitching that held the various blocks together. Now that doesn’t mean I took absolutely everything apart. Heavens, I think I would have to have my head examined if I did that. 🙂 Just the stitching between the blocks was removed. Not all of the seams were carefully taken apart with a seam ripper either. I did take a shortcut or two with my rotary cutter. snicker The amount of fabric I lost by using the rotary method was so minimal but way faster. The less time I could spend on destruction the better. My gears were itching to turn the corner and get back to positive progress. More often that not, contemporary quilt makers collect a lot of fabric. On the surface, this may seem like a design advantage, but in actuality, this abundance of choice can become overwhelming. On the flip side, when you are forced to innovate with what you have and you do not have a lot, your improvisational skills are honed. One way to create the aesthetic opportunity to make do, even if your fabric stash is hefty, is to purposely limit your fabric amounts on the tight side at the outset of a project. Note: the emphasis added to selected words in the quote is of my doing. Anyway, getting back to the quote, not only had I made the decision, at the onset, to try and use all of the fabrics in the scrap bag, but I had also now added the challenge to make do or limit my fabric options. This meant I had to get creative. There were obvious holes that needed plugging in my design and my scrap inventory was drastically low. So, get creative I did. Here’s a photo of my quilt in its current state. The print fabrics that were not included in the scrap bag have, for the most part, been eliminated. Some of the blocks have been redesigned. Especially the one in the top left corner. Twelve blocks are brand new. 99.9% of the new blocks were created with fabric from the scrap bag and added solids. The block arrangement is different. I must admit I had fun creating the additional segments. 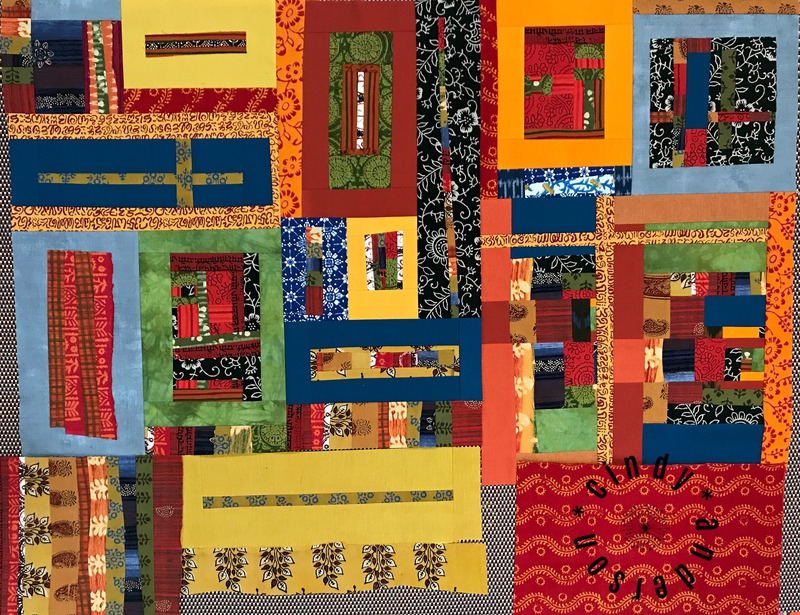 I was bound and determined to use as many of the tiny scraps as possible so I drew upon my knowledge of quilting to even make a paper pieced block. There were times when I got really nervous about not having enough fabric. This happened at the very end. My inventory was so low. All I really had left were itty-bitty scraps and of course my solids. Just when I thought I was going to have to resort to the solids I happened to pull out my rolling cart. There in the top bin was a fairly good sized piece of useable fabric. Oh how I breathed a sigh of relief! My discovery meant I would be able to fill in all the gaps and finally call my piece finished. To coin an American phrase, “The Goose is Cooked.” If you are not familiar with this idiom let me put it another way, “It is FINISHED.” Hip Hip Hooray! Yippie! 🙂 Does that help? Throughout all of these six posts I have yet to explain the origin of the name. Though, you haven’t asked either!!! What gives with that? Aren’t you curious? 🙂 Don’t think I haven’t been dieing to tell you. I have but I thought I would wait until the end. So, this is where it came from. When I purchased my small bag of fabric scraps there was a ribbon tied around the top of the bag cinching it tightly closed. Attached to that ribbon was this tiny piece of paper. As you can tell from the photo the words “Bits and Pieces” were written in ink. This little tag gave me the inspiration to call my newest art piece Bits and Pieces. Kind of corny I know. But hey, nobody ever said names had to come from a magical place. Let me pose the often heard phrase, “So what do you think?” Is it a keeper or not? Thank you for sharing this time with me! I look forward to our frequent visits. Who knows where my art-filled adventure will take us next? Oh, I almost forgot! You are probably wanting to read the first five posts in this journey. Let me share them with you. Handloom Batiks makes some gorgeous fabrics – wow – thanks for sharing where these awesome fabric come from! I think the makeover is terrific. To me it seems more cohesive, more unified than the original composition. I applaud you for taking your rotary cutter to some of the “unstitching.” That was brave and worthwhile! It definitely is a different piece now. I’m having trouble deciding whether I like it better. The first version was brighter feeling, though there are bright fabrics in the second version, too. The bottom one feels more green, which is my favorite color, but I can’t really decide if I like one more than the other. =) What’s really important is that YOU like it better! Definitely a keeper! Thanks for sharing the process. I love the idea of making do with what you have. It doesn’t limit you, it helps you be more creative and resourceful. It has been a fun, learning experience traveling in this journey with you. What a fun and funky end result! You are inspiring me to make one because this would look so FAB on my bed! I like that little push, it’ll keep me accountable! Oh me too! I’m so glad I found your blog!